Oh yes. Summer is here. It was 100 degrees today, and the kids only have 2 weeks left of school. I am officially giving over to summer brain. They've been staying up well past bedtime, we have been swimming at least three times a week, and I am letting my kids (completely against my usual policies) madly scramble to use up all the free homework passes their teachers gave them, before it's too late. This is the crazy time of year, when there is a performance or banquet or party or ceremony several nights a week. Every group we belong to wants to celebrate the closing of the season. I have signed up to provide refreshments, snacks, equipment, pot luck dishes, and my service in three different classes, for the baseball teams, the cub scouts and the girl scouts, the orchestra and at work. However, I have also tried my darndest to make sure that we are getting a decent dinner, even on nights when we rush from one place to another. That having been said, though, it has been over a week since we sat at the dining table. (And I know this because the mountain of schoolwork that came home from Open House night at school is still sitting there. Nine days later). Instead, we have been eating on the back patio. And eating outside goes best with cooking outside, no? Tonight we had sliders for dinner. I am not sure exactly why, but my kids would prefer to eat a few sliders rather than one larger burger any day of the week. So, fine then. 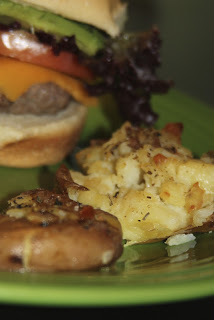 Little burgers and yummy sides. And the sides were indeed soooo yummy. I made the zucchini carpaccio that I tried last summer (heaven!!) 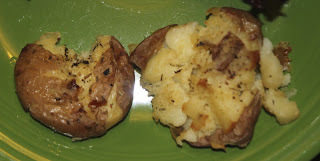 and I also made these potatoes. I found this recipe on the website for America's Test Kitchen, and I have to say that I almost decided to pass on a burger of any size, and just eat potatoes for dinner instead. They were so very much the exact way that I like to eat potatoes. Salty and seasoned, crispy on the outside and soft in the middle. Potato heaven. 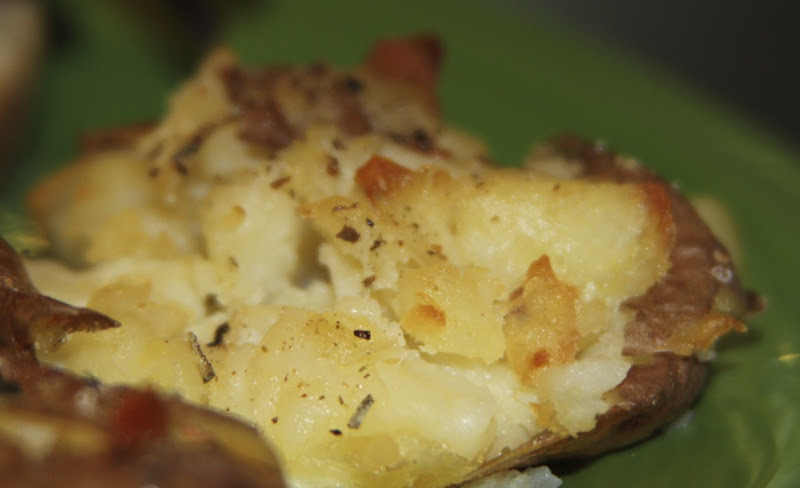 Take some small red potatoes (any number will do... make as many as you can, in my opinion!) and scrub them well. Then, boil them in some salty water just until they can be easily pierced with a fork. You don't want them fall-y apart-y, you just want them crushable. Then drizzle a pretty decent amount of olive oil on a baking sheet. Think of this: The more oil, the more crispiness, and the less sticking. Place the potatoes on the baking sheet, and with the bottom of a glass, crush each one until it is about 1/2 inch thick. Next, drizzle more olive oil all over all of the smashed potatoes. Again, remember that the oil will contribute to the crispiness. You will be glad you did. Sprinkle some dried thyme over all of the potatoes, and some salt and pepper. I went heavy on both, and boy was I glad I did! Now, place the sheet of potatoes in the oven (even if your husband came home from work and stole one and told you that you can stop there, he loves them the way they are... it's going to be okay. Just roast the rest of them). Let them brown and crisp for about 25-30 minutes, and then pull them out and enjoy! They are good before you roast them. But after? They are excellent.